On this eight day Patagonia skiing safari we penetrate the Heart of the Andes Mountains and explore the mythical ski resorts of Alta Patagonia – Catedral , Chapelco and Cerro Bayo. We will visit the Patagonia ski towns of San Carlos de Bariloche, San Martin de Los Andes, and Villa La Angostura. This Patagonia Ski Safari combines all the best of Argentina skiing resorts offering a terrific exposure to the culture of Patagonia, Argentina and its famous nightlife as well. Our Patagonia skiing guides will meet you and the group at the airport in the “Swiss-styled” city of San Carlos de Bariloche, situated alongside beautiful Lake Nahuel Huapi. We will spend three nights, in the heart of the city, just minutes away from the world class ski resort of Alta Patagonia- Catedral. San Carlos de Bariloche is world famous for powder skiing, Argentine steak dinners, regional wine, fine chocolates, the shopping district, and electric nightlife. The apres ski activities in San Carlos de Bariloche will almost as good as the Patagonia skiing! Cerro Cathedral is the main skiing mountain of San Carlos de Bariloche. Prior to 1998, the mountain had a number of competing ski lift companies that merged to form the resort of Alta Patagonia and uniting the entire lift system under one All Mountain Pass (lift ticket). The mountain itself is owned by the Argentine government and like its namesake, Alta, in the Utah, it is blessed with spectacular powder. Over half the trails on Cathedral are rated intermediate or higher making this one of South America’s greatest snow skiing destinations in the same league as skiing Chile’s Portillo and Termas de Chillan. Alta Patagonia is a European Style resort with one of South America’s only tramways. We will spend two full days here exploring the intermediate and expert Argentina ski trails of Alta Patagonia – Catedral with panoramic views of Volcan Tronodor (3554 meters, 11,660 ft) and Parque Nacional Nahuel Huapi. There is no finer skiing in Chile or Argentina than Cerro Cathedral! After the lifts close we will be spend some time in the small Argentina ski village at the base of the mountain. Here we will be able to relax, order a drink and snacks, check our e-mail, do some shopping and experience the Argentina skiing scene firsthand. Your evenings are free to sample Argentina’s fine dinnertime cuisine, try your luck at the local casino, go shopping, experience Bariloche’s famous nightlife or just relax. On the morning of our forth day we will head north from San Carlos de Bariloche to the ski resort town of San Martin de Los Andes, then ski Patagonia’s Cerro Chapelco Resort. Our route takes us through the gorgeous Lake District of Argentina. Depending on road conditions, we have several options to get us to Chapelco Ski Resort, including the jaw dropping views along “Siete Lagos” (7 Lakes). The beautiful drive through Northern Patagonia, and into the famous forest lined Andes dotted with hundreds of crystal clear lakes and trout filled streams is unforgettable. We will spend the afternoon at Chapelco, above Lacar Lake in National Park Lanin. If you choose to take the day off from Argentina skiing, the afternoon is free to relax at your comfortable hotel or explore the streets on San Martin de Los Andes. Cerro Chapelco is relatively new Patagonia ski resort opened in the 2000. It is located about 20 kilometers outside San Martin de Los Andes inside Parque Nacional Lanin near Volcan Lanin and Lake Lacar. Unlike Cerro Catedral, Cerro Chapelco is covered by old growth forests. The lichens on these trees hang like beards making for a unique and surreal Patagonia skiing experience. The resort itself boasts about 30 % intermediate trails and 30% expert trails. It is also much less heavily skied than Cerro Cathedral providing even greater opportunities to find Patagonia powder. Skiing in Patagonia doesn’t get much better than this! In addition to well maintained and groomed trails, Cerro Chapelco offers something truly special for the off-piste skier. 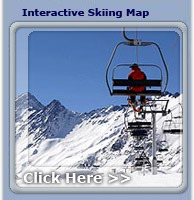 Because the resort is situated in old growth forest of it offers a truly unique tree skiing experience. Proficient tree skiers can ski the entire mountain without coming out of the trees. The mountain itself is serviced by 12 lifts including a six person gondola. Chapelco’s mountain village plaza is a great way to spend the afternoon once the legs are dusted. With a mix of local skiers and boarders, live music, fresh coffee and Quilmes (locals choice in beer), you find it a perfect spot to watch the sunset below the Andes Mountains! After the ski lifts close the afternoon is free to relax in the plaza, head back to your comfy hotel or explore the streets of San Martin de Los Andes, one of our favorite Patagonia ski towns! A classic Argentina ski village, this town has numerous international restaurants, bars, and a casino to keep the nightlife going. What we do next will be based on the Patagonia skiing and snow conditions at the time of your trip. On this day we will either ski Argentina’s Cerro Chapelco again or go to the Cerro Bayo ski resort. If there is powder the Cerro Bayo option comes into play. In this case we will leave for the charming alpine village of Villa La Angostura where we will spend the next two nights. Located on the Northwest tip of Lago Nahuel Huapi, in a remote side canyon, is the Cerro Bayo skiing center. Cerro Bayo was opened in 1978 and is one of the older resorts in the region. The mountain of Cerro Bayo has a double summit (1,780 meters, 5,850 feet) that offers stunning panoramic views of the Lake Nahuel Huapi. It is located about 10 kilometers from the village of Villa La Angostura. This resort is way off the beaten tourist paths and offers, eleven lifts, limited crowds, fun locals, a storied history, and a profusion of good steep powder runs. Cerro Bayo is one of our favorite spots for skiing Patagonia! Villa de Angostura (Spanish for narrowness) sits astride the Quetrihue Peninsula and is the gateway to Los Arrayanes National Park, virtually an island in Lago Nahuel Huapi, known for its six hundred year old Arrayan Trees (Myrtaceae bushes). The town numbers about 11,000 people and resembles a traditional European ski village constructed of wood. Villa de Angostura offers numerous places for after skiing relaxation. Dinner will be spent at our preferred restaurant with dishes like smoked salmon, venison, fresh trout, wild boar, famous Argentine steaks, and excellent red wines from the Mendoza region. Day 8: Patagonia Skiing Safari Departure. We will spend the morning skiing Patgonia’s Cerro Bayo. In the afternoon we conclude our Argentina skiing week with a short, shoreline drive of 86 km from Villa La Angostura to the airport of San Carlos de Bariloche. There you can catch your return flight to connect to your flight home. If you want more skiing in the Andes consider one of our Chile skiing options like Portillo, Termas de Chillan or Valle Nevado. Included: Experienced ski guides and trip leaders, Airport pick-up, Delicious unforgettable meals, Comfortable lodging from superior to deluxe, Private transportation, lift tickets. Note: The ski season in South America is opposite that of North America and Europe. The months we typically ski are: March, April, May, June, July, August, September, October, November.